In March 2014, I was contacted by Osney Media to see if I would be willing to answer some questions about the future of Communications. I was very candid (I prefer the word ‘passionate’, but this is what I hear more often), so my answers totally reflect what I believe in. There were exactly 7 questions. I forgot all about it, and carried on juggling work-life balance, even attended a conference where I was invited to a panel discussion by the same organisation. Thinking about it now, I wish I would have remembered this interview, as some of my then written answers would have come handy during the live discussion. But life is busy – and so is my memory. You can read all about The Future of Employee Engagement, in the answers provided by a ‘panel of experts’ (as mentioned in the introduction) – nine professionals* from the HR and Communications fields across different industries. I feel honoured to be in such great company. *Gary Kildare, IBM – Carol Muldoon, Starbucks – Ingrid Eras, Starwood Hotels & resorts – Ralf Larsson, Electrolux – Katharina Auer, Zurich Insurance Group – Minna Tornikoski, Tieto – Serge Peeters, Belgacom – Katri Heikkila, Fiskars – Muriel Pineau, APM Terminals. Who will be the future drivers of employee engagement? Will it come from HR or is it down to the line manager to create culture where their teams, or individual staff, feel valued and heard? 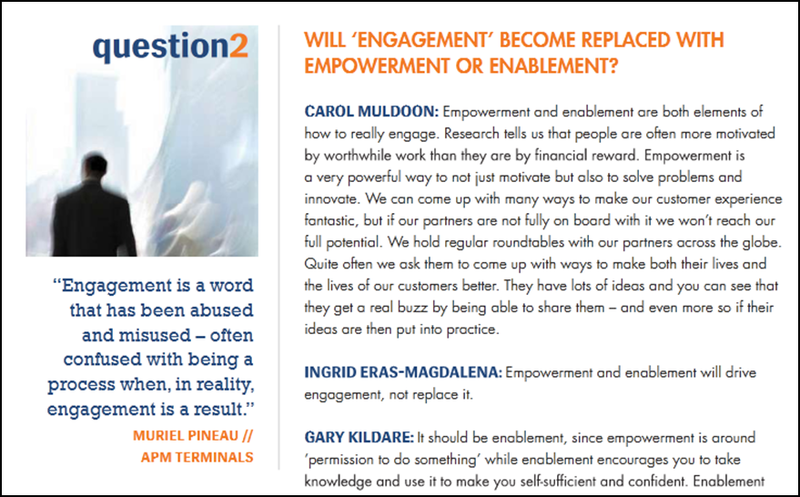 Will ‘engagement’ become replaced with empowerment or enablement? Employee engagement surveys are dead. Long live crowdsourcing – true or false? This entry was posted in corporate, employee engagement and tagged Employee engagement, talking business. Bookmark the permalink.